A bull trap, and conversely a bear trap is one of the commonly occurring patterns that most traders dread. As the name suggests, the traps are formed in order to capture the weak bullish or bearish positions before price reverses. The bull traps and bear traps can lead to huge losses for traders. A bull trap or a bear trap is primarily a chart pattern that occurs quite often, yet traders tend to ignore this only to see the so called profits turn into losses. Even traders who make use of technical indicators in their trading will come across the bull trap or the bear trap pattern. Using technical indicators does not guarantee that you will be able to avoid these patterns. Therefore, the best way to avoid or to trade the bull and bear trap patterns is to first have a clear understanding. In this article, we take a look at the bull trap and the bear trap pattern and how these patterns can influence your trading decisions. What is a bull trap pattern? A bull trap pattern is more evident when you are trading based off chart patterns. It is common especially when there is a breakout. 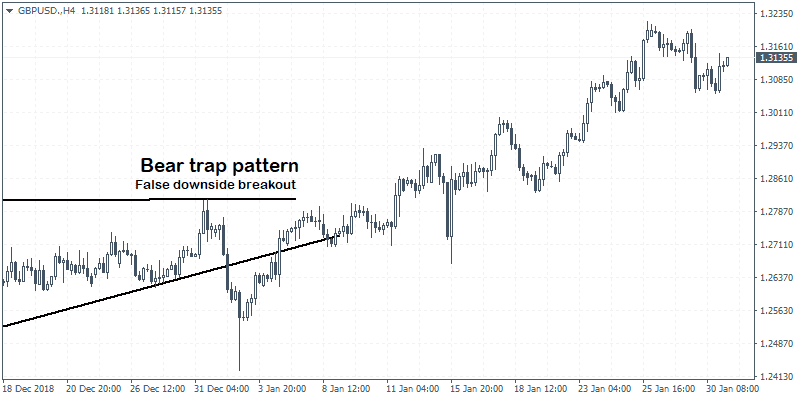 A breakout trading strategy is often one of the most widely used methods. Due to the fact that prices tend to remain trading sideways more than moving in a trend, breakouts are closely watched by traders. A bull trap commonly occurs right after prices have been consolidation. The consolidation can come in different ways such as triangle patterns, wedge patterns and so on. In the context of a bull trap pattern, you can find this occurring when price initially pushes higher before reversing the gains from the initial breakout and reversing directions. As you can expect, the bull trap pattern captures the long positions and then reverses course. Traders who end up closing their positions add to the selling as well giving it a rapid move. 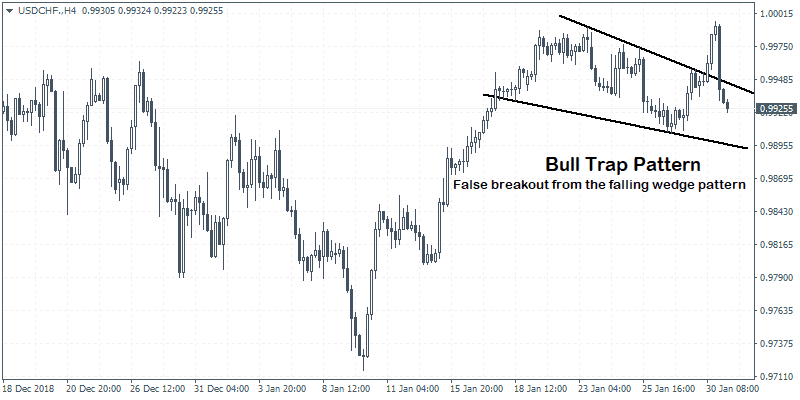 The bull trap pattern can occur either at the end of the trend in a rally or within a trend following a consolidation. The bull trap pattern within a trend could signal a major correction or potentially a reversal of the trend as well. The first chart below shows a typical bull trap pattern. In Figure 1, what you can see is a wedge pattern that has formed. A wedge pattern is often considered to be a consolidation pattern. Given that the previous trend was to the upside, the obvious expectation is that price will breakout to the upside. As expected, price breaks out to the upside from the falling wedge pattern. This would entice traders to take up long positions on the instrument. However, no sooner that the breakout occurs, price action reverses course and posts a strong decline. You can see this by the strong bearish candlestick that is formed. Soon enough, price closes back inside the wedge pattern. This is one of the classic bull trap patterns. There are many other similar examples that you can find. What is a bear trap pattern? A bear trap pattern as the name suggests is the exact opposite of a bull trap pattern. In this case, price action entices traders to take short positions after a brief period of consolidation. Following this, price initially breaks out to the downside. This would seem like a valid trade until price reverses course and moves higher. Such a move traps the bear positions leading traders to quickly close their positions, which adds to the bullish momentum. A bear trap pattern can occur at any point in the trend but it can be quite evident during the end of a down trend or during a bottom formation. A bear trap pattern can signal a correction or potentially a reversal of the trend. Let’s take a look at an example of a bear trap pattern. In figure 2, we have a triangle pattern that forms right after a downtrend. Following the triangle pattern formation which indicates consolidation in price, we see that price breaks to the downside. The logical conclusion here is for price to trend lower. This would bring in a lot of sellers into the market. However, no sooner that price breaks to the downside, we see a strong reversal following which price starts to gradually trend higher. As you can see from the above bear trap example, it is a classic pattern that forms which traps the bears before reversing course. Why do bull traps and bear traps occur? While there is no clear evidence that suggests a particular market action behind these bull and bear traps, one thing is clear. The bull and bear traps are associated with strong price action in the reverse or opposite direction. In a bull trap, price initially makes a high and then retreats. Following this, price then steadily rallies to the previously established highs. We can expect a brief couple of sessions that can spike higher than the previous high. Following this, price reverses direction sharply. In a bear trap, price makes a low following a strong downtrend. We then see a rebound of price that marks a correction to this downtrend. A few sessions later, price once again starts to decline and posts a lower low. This later results in price action reversing off the lows and moving in the opposite direction. During the bull trap and bear trap patterns, you can also look at the candlestick patterns that are formed. Usually, you would find reversal patterns such as engulfing candlesticks or shooting star or hammer patterns that are formed when the bull or bear trap patterns are formed. Pay attention to the fundamental news that is developing when price retests the previous highs or the lows. The fundamental news can reveal information that can be surprising to the markets. In other words, when the news is not discounted by price already near the previous highs or the lows, you can expect to see a reversal trapping the bullish or bearish positions. One of the reasons why price action is so rapid is due to the traps itself. The bull and bear traps can be strong and rapid as the weak bullish and bearish positions start to close out their trades. This further adds to the momentum. In technical terms, you can commonly see the short squeeze occurring near the bear traps, where weak short positions are squeezed out as price reverses direction. Another factor to bear in mind that the bull and bear traps occur across all intervals or chart time frames. This allows you to scan for this pattern across different instruments and time frames. You can find bull traps and bear traps within a few candlesticks or sessions or it can span across prolonged periods of time. How to trade the bull traps and bear traps? To be successful in trading the bull traps and bear traps, you need to be patient. Bear in mind that this would mean you will have to miss out on some good trades as well. Bull and bear traps are not that commonly occurring when compared to breakout trades. However, one way to be prepared for the bull and bear traps is to watch for price action near the top of an uptrend and bottom of a downtrend. Typically, price tends to move sideways after a prolonged trend has been formed. Thus, once you see this consolidation you can stay alert for any bull trap or bear trap patterns that could form. Technical indicators such as oscillators are also a good way to trade the bull and bear traps. Typically, you will observe divergence forming near the bull and bear traps. A divergence is when the oscillator fails to mirror the new high or the new low in price. Combining the above information, you can now look at the trend, the consolidation, the chart pattern and the divergence to build a good strategy to deal with the bull and bear trap patterns. In figure 3, we have a classic bull trap example. The first thing to observe here is the uptrend that was formed previously. Following this steady uptrend, we can see that price makes a fresh high. Following this high, price then reverses to correct and attempts another move to the upside. The second time the previous high is retested, price briefly breaks higher but fails. Note that during this process, we have an ascending triangle pattern that is formed. This pattern typically signals an upside breakout. While it is easy to see that price reversed direction in hindsight, as the markets develop in real time, the ascending triangle pattern is a valid pattern. 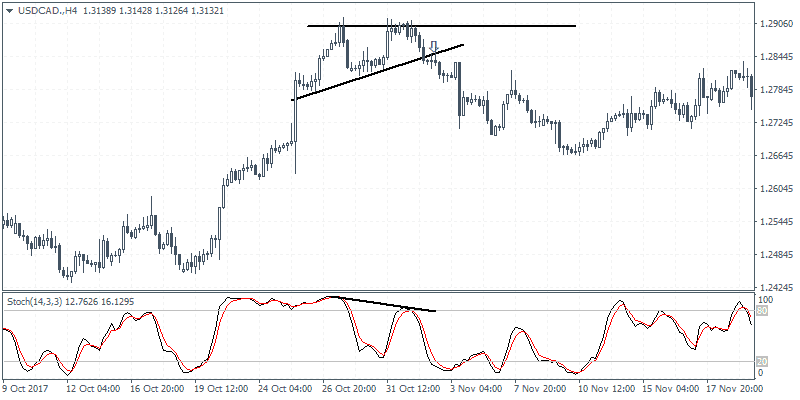 Now, when you compare the price action to the Stochastics oscillator, you can see a bearish divergence. 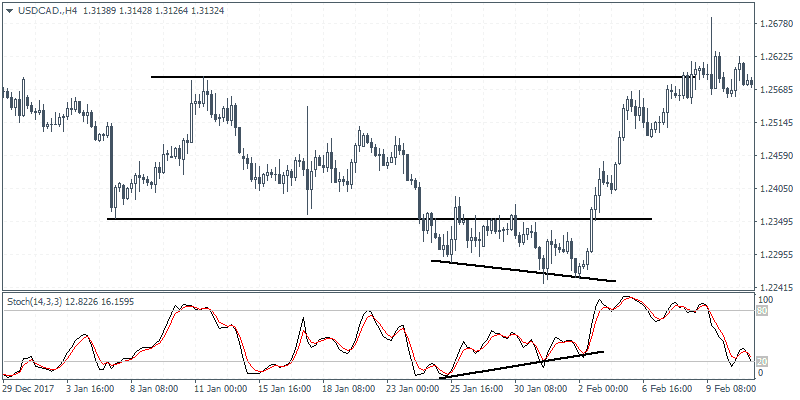 The bearish divergence is formed as the Stochastics oscillator forms a lower high in price. Evidently, price action breaks to the downside and posts a sharp correction lower. In the next example, we can see a bear trap pattern. Here, price action moves sideways after a steady downside decline in price. Following this, a sideways range is established with price staying within the initial highs and lows that are formed. Finally, after a significant amount of time, price breaks to the downside. This would tempt short sellers to enter the market. Price initially slips up to a certain point before retesting the downside breakout. Logically, this retest of the downside lower boundary of the sideways range would bring in more traders as they waited for this retest. Price then posts a lower low. However, just as quickly, you can see the reversal taking place. The short positions that entered near the breakout level would be trapped. If you look at the Stochastics oscillator, you can see the bullish divergence in price. Price makes a lower low but the oscillator makes a higher low, signaling this bullish divergence. Once the divergence is detected, price action then moves to the upside. You could avoid the bear trap pattern by looking at the Stochastics oscillator which would have signaled you that there was an upside risk to this trade. We have learned so far how the bull trap and the bear pattern is formed. While these patterns are common to break out trading, they are more evident near the tops and bottoms in an uptrend and a downtrend respectively. The bull trap and bear trap patterns require the trader to be prepared for the reversal. Sometimes, price can continue to move in the direction of the break out while at times, you can see the classic bull trap and bear trap pattern. An important point to bear in mind is that this is a strategy that is not clearly defined. Therefore, the bull trap and bear trap patterns can be combined within your existing strategy. They can alert you to potential reversal in price action. When a trader is patient enough to wait for these patterns to emerge, big profits can be logged. However, on a general basis, such traps in the positions are not commonly found. As a result, waiting only for the bear or bull trap can result in having to sit out of good trading opportunities. Using a combination of the chart patterns, the candlestick patterns, technical indicators and divergence you can aptly find these trading set ups across different time frames and assets. Note that the patterns can form within just a few sessions or over a broader horizon. Due to the fact that price action is often strong and rapid, traders also need to focus on deploying a good risk management strategy. Still, overall, trading the bull and bear trap patterns are a good way to make profits quickly instead of having to keep your trades open over long periods of time.